There is always plenty of attention given to the most obvious aspects of our health; diet, exercise, mental health, medications, vaccines etc. But there is one side to our health that tends to be ignored - Skin Health and Skin Care. We’re going to talk about some of our own health realisations over the past few years and how simple, natural, organic skin care products, like Taslie, could play a role in living a long and healthy life. Jonathan and I have been travelling the world together for about 4 years now, which came with some pretty significant lifestyle changes. To be perfectly honest, environmental sustainability wasn’t a great part of our decision making when we started travelling, or even in thinking about how we travelled. Likewise, in the early days our health and well-being was something that we just took for granted, assuming we’d stay fit and healthy easily as we travelled from country to country. However, as we travelled more slowly, eventually working for ourselves, we had time to notice the things about our lifestyle and how they affect us; diet, exercise, sleep routine, air quality - a big change in any of these things can have an affect on how we feel. So we started to think a lot more seriously about what we put into our bodies, essentially how we eat and drink. We both stopped smoking and we rarely drink alcohol anymore. We eat much less processed foods and lots more fresh vegetables with smaller amounts of meat and fish. We still don’t get any where near as much exercise as we would like to, but our lifestyle of near-constant travel means that we have to compromise on something! Look for the shortest list of ingredients that we recognise - i.e. Little-to-no chemical formulas! If you wouldn’t put it in your mouth, don’t put it on your skin! Ok, so we can’t always stick to rule number 2, but it’s a good guideline that we try to follow! This new philosophy around our health and our skin is what made us so interested to be contacted by a company called Taslie, a natural and organic skincare company based in Canada and started by mother and turtle conservation enthusiast, Tami Main. Tami actually developed Taslie skincare products out of her own need to find gentle, natural and caring products for her baby girl. Fast forward to today - Taslie has a range of natural, organic and skin-kind products designed for the sensitive skin of babies and young children, but also perfect for any adults too, especially those with sensitive skin. Taslie is a range of natural, organic and also environmentally responsible skincare products which are designed primarily for babies and children. Canadian mother, Tami Main, founded the company when we noticed a serious need for truly natural, gentle skin products for the super-sensitive skin of young children. As well as using sustainable packaging, the short list of natural ingredients means that Taslie’s products are much kinder to the environment when they wash down your drain and back into our water systems too. That’s something to think about the next time you pour yourself a glass of water for the kitchen tap! Being a mother herself, Tami’s main motivation is in helping other mothers choose the right products for their children, but she is also a passionate supporter of Sea Turtle conservation programs, with a part of the profits going to turtle conservation. Why Choose Taslie Skincare Products over ‘Normal’ Products? 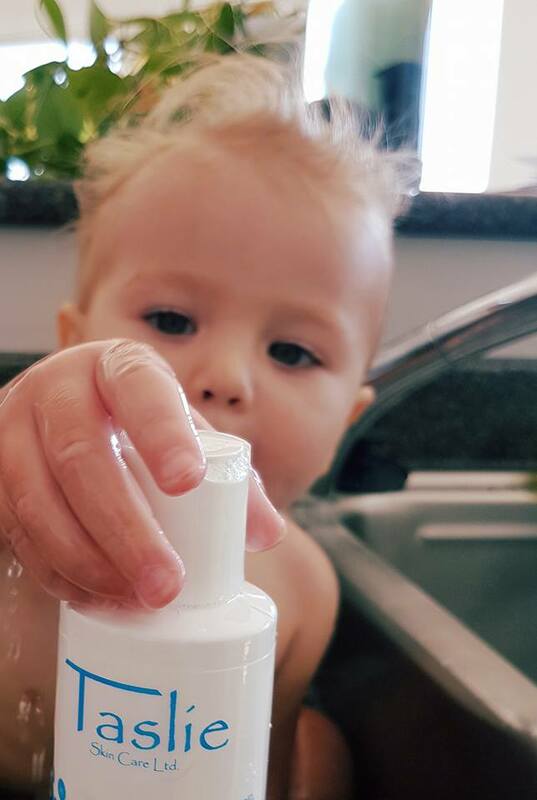 Taslie is developed for the smallest of babies with the most sensitive of skin, so it must be good for everyone! Skincare is not just about your skin - Our skin absorbs what we put onto it, which ends up in our bodies. Children’s internal organs are much more sensitive than adults, so we have to think about what we put on their skin. Taslie does not contain Sodium Laureth Sulphates, Lanolin, Parabens or synthetic colours and fragrances. Taslie is supporting partner of The Canadian Sea Turtle Network, so some of the profits from the sales of Taslie Turtle bottle products go towards the protection of endangered turtles. 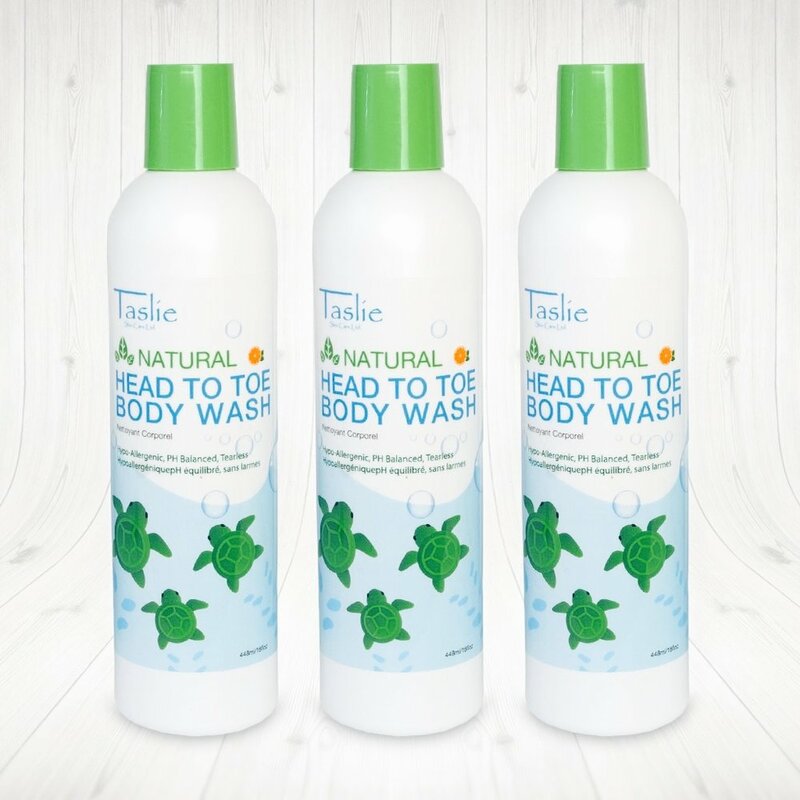 The Taslie head-to-toes wash comes in a cool turtle bottle, making it fun for kids to play with in the bath, but also finding a light way to make them aware of the direct connection between what they wash down the sink, and the water that other animals have to live in. We think it’s fantastic that someone who sees a need for a safe, natural organic product would go out there and research, develop and then create it for themselves. Even better, Taslie natural skincare products aren’t just designed to benefit the humans who use them, but also the environment we live in and the animals within it! As for our thoughts on the products themselves… We have only just started using them, but our initial impression is that they all smell fantastic and they leave our skin feeling fresh and super soft. Also, Jonathan says the short lists of natural ingredients suggests we could put it in our mouths if we wanted to, so we can definitely put it on our skin. I have yet to catch him drinking the L’enfant Lemon Creme Hair Conditioner, but I’ll keep you updated on that! If none of that is enough to convince you, then have a look at some of the testimonials Taslie Skincare has received from doctors who use the products for themselves and their families. A 3-in-1 hair, body and bubble bath which is great for kids, but also for adults with sensitive skin. Natural goodness enhanced with rosehip & burdock, and mandarin & vanilla essential oil. Non-greasy moisturizing lotion made with organic marigold, camomile, mandarin and vanilla essential oils! Naturally gentle antibacterial handwash with a kick of fresh grapefruit! A natural, plant-based wash to soothe bum irritations caused by diapers. Jonathan could have used this for the bum rash he got on his recent motorbike in Vietnam! Natural organic conditioner with lemon and vanilla essential oils! BUY YOUR TASLIE PRODUCTS, NOW!